If only one camera was selected in the Start page — Camera List and GO button clicked, the Single Camera View is launched with live video streaming from the selected camera. The Single Camera View can also be launched from the Multi-camera View for any camera in the group via the GOTO option in the right-click menu. Click the Full Screen button at the bottom of the screen to view the streaming video in full screen. Click the arrow toggle button in the upper-right corner of the Single Camera View to open/close full screen mode. Hide/show the Controls panel by F key on the keyboard. Zoom — if the camera being viewed is a PTZ camera, the Zoom controls will be active (depending on permissions in the Remote Client). Clicking within the 0-100% scale will adjust the zoom coordinate of the camera to that percentage of the camera’s full zoom capabilities. Users may also enter the desired percentage in the text box and click SET Zoom to define a specific zoom percentage. Pan/Tilt — if the camera being viewed is a PTZ camera, the Pan/Tilt controls will be active (depending on permissions in the Remote Client). Clicking the arrows will move the camera view in that direction one step. If the camera has a Home position defined within it, the H button will send it to that position. Resolution Selection — when the Live View is launched, the video is streamed in a default resolution as defined in the NVR. Users can change the resolution of the video to another resolution supported by the camera using the Resolution drop-down list. This will visibly affect the quality of the image. Compression Selection — when the Live View is launched, the video is streamed with medium compression by default. Users can change between low, middle and high compression using the drop-down list. This will visibly affect the quality of the image. The resolutions available will depend upon the camera type being viewed. Axis cameras with an auto-configured driver in the NVR will show the specific resolutions supported by that camera model. 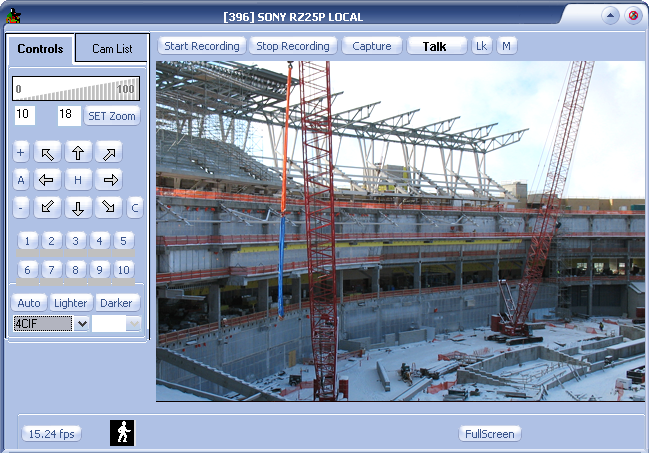 In the Multi-camera View the user can Center Video on the Spot for any PTZ camera as well and Zoom In/Out by clicking Page Up/Page Down buttons.